As sweet as cinnamon: Check Out Fiona Too! a complete kit to make my "Family Love" wall quilt. 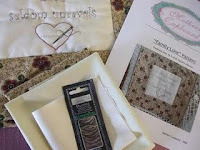 The kit includes :- stitchery fabric, border and binding fabric, backing fabric plus easy to follow instructions and a pack of Madeira Variegated Rayon Thread. So pop over and enter Fiona's Giveaway now! Comments to be left on post before this one. And please remember to leave your email if you are a non- reply blogger. Awesome giveaway - please enter me! Woohoo, please enter me in the giveaway! I would love this. I'm so excited about this new blog, I just can't stand it! I am a Gum Tree follower and put the logo on my blog. Please enter me in the giveaway. I have posted the Under The Gun Tree Button on my blog. ok I need to win. pick me, pick me! LOL. I am enjoying this new blog. thanks for all your hard work. Sorry no blog but hopefully I have ticked the right box. Thanks for a lovely giveaway. Hi Dawn, yes I am a follower, added your button on my sidebar and would love to enter your prize giveaway with your new exciting Among the Gumtrees venture. Please sign me up for the giveaway. I am following your site as well as the Gumtree Site.